29 Jan 2019, 10:53 a.m. In the wake of Bitcoin’s latest slump, one CEO believes that Bitcoin’s moment of glory is over, and those who bought into it are now realising that gold, not Bitcoin, is the long-term haven to back. Jan Van Eck, of the investment management firm Van Eck Associates, was talking to CNBC for their financial news segment ‘ETF Edge’. Speaking from the perspective of an asset trading firm (and one with extensive knowledge of gold), Van Eck explained how his firm had polled investors who backed Bitcoin to gauge their current intentions and motivations. Bitcoin has been below $4,000 per coin for the last three weeks, and currently languishes at $3,428.05 – down 4% for the week. It’s not the only cryptocurrency to suffer either – a quick look at the market shows a sea of red, with rivals XRP, Ethereum, Tether and even Bitcoin Cash all making notable losses. It was only 12 months ago that Bitcoin was at an astounding $12,000 per coin, with brief spikes registering even higher, so the size of the fall is remarkable. At its height in January 2018, the whole cryptocurrency market was worth $819 billion. Now that market cap is down to $112.1 billion – a staggering 86.31% decline. The latest publication from the World Gold Council also echoes the sentiments that cryptocurrencies are not a safe haven for investors. The WGC highlight how cryptos did not behave like havens while the stock markets fell. Instead, they did the same – they displayed volatility and their general value dropped. 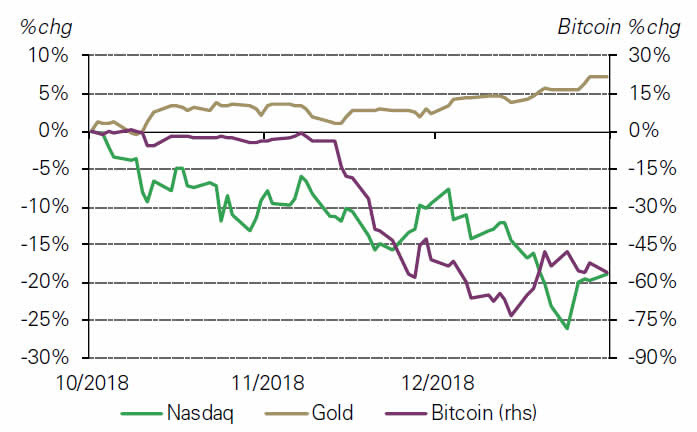 As the chart below shows, Bitcoin and the Nasdaq had significant correlation in Q4 of 2018.